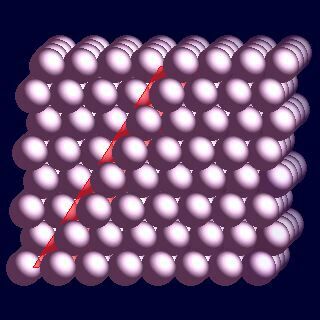 Scandium atoms have 21 electrons and the shell structure is 2.8.9.2. The ground state electronic configuration of neutral scandium is [Ar].3d1.4s2 and the term symbol of scandium is 2D3/2. Scandium: description Your user agent does not support the HTML5 Audio element. Scandium is a silvery-white metal which develops a slightly yellowish or pinkish cast upon exposure to air. It is relatively soft, and resembles yttrium and the rare-earth metals more than it resembles aluminium or titanium. 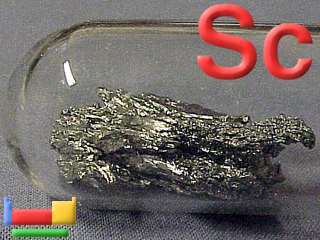 Scandium reacts rapidly with many acids. Scandium is apparently a much more abundant element in the sun and certain stars than on earth. Image adapted with permission from Prof James Marshall Prof James Marshall's (U. North Texas, USA) Walking Tour of the elements CD. The solid state structure of scandium is: bcc (body-centred cubic). Reactions of scandium as the element with air, water, halogens, acids, and bases where known. Binary compounds with halogens (known as halides), oxygen (known as oxides), hydrogen (known as hydrides), and other compounds of scandium where known. Bond strengths; lattice energies of scandium halides, hydrides, oxides (where known); and reduction potentials where known. Scandium was discovered by Lars Fredrik Nilson in 1879 at Sweden. Origin of name: from the Latin word "Scandia" meaning "Scandinavia". 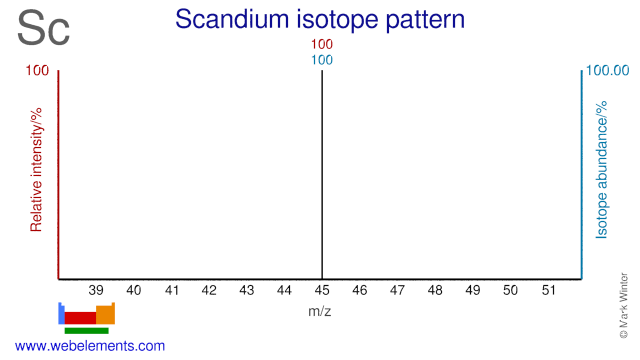 Isotope abundances of scandium with the most intense signal set to 100%. Isolation: preparation of metallic samples of scandium is not normally necessary given that it is commercially avaialable. In practice littel scandium is produced. The mineral thortveitite contains 35-40% Sc2O3 is used to produce scandium metal but another important source is as a byproduct from uranium ore processing, even though these only contain 0.02% Sc2O3.